Zuma360 | Some girls go to the spa. I play Zuma. I’ve moved my cooking blog over to the website of my new online cooking show Building Blocks. On our show you learn to make your own ingredients for more fun and flavorful cooking. You can find the blog here. Please come check us out and tell your foodie friends! We have episodes Making Coulis and Making Beef Stock up which include some of my favorite recipes, like meat pie and strawberry lemonade. We have already shot our next episode, a lesson on Italian red sauce “Sunday gravy” with guest cook Vinny Pasceri. Look for that late next month. I’ll leave this site up but disable the comments. You can contact me at kim[at]buildingblocksshow[dot]com or go to the new blog location and leave a comment there. Since I haven’t had anything new to post in quite some time, I’m going to retire from Zuma blogging. Of course, I’ll leave up the site, but I won’t maintain it and I’ve put in approval and site log-in requirements for posting so at least it doesn’t get filled with spam. Thank you to my readers and all those who have added insight with your comments. I hope Zuma360 brought some fun to the blogosphere. I will continue blogging at my science and life blog, ribonucleoblog, and I have a cooking blog I’m trying to get off the ground as well. Check out Flour on my Keyboard!111. I have finally given in and started playing under my own gamertag. I was previously just using my husband’s gamertag, Harry Holt. Farwell, Harry. It’s been good. I’ve just played my first game of Zuma under the new tag this morning and I’m now #11 in the leaderboards. In other news, I tried Crack Down last night. As you may know, I don’t normally enjoy games which aren’t puzzle-type, but this was fun. The controls were easy to use and I liked driving the cars. I don’t think I’m motivated enough to go buy my own copy, but it did change my view of shooter games to a more positive one. 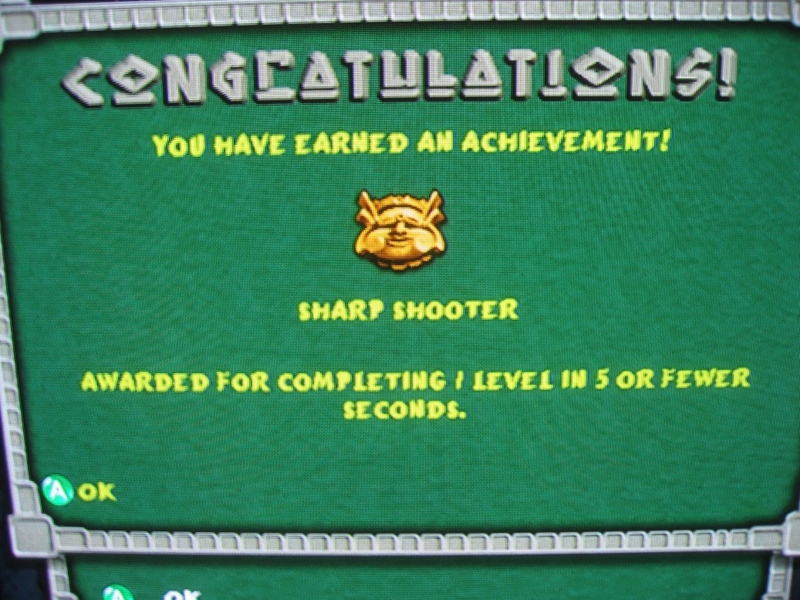 A few days ago I earned the last achievement on my list: Sharp Shooter. I thought I’d feel elated. I thought I’d have new insights into the game. But, no. That was last week and I wasn’t even motivated enough to blog about it until now. I am more certain now than ever that it is pure luck: Luck of having the right string of balls come out. Luck of having the right color of ball lined up to shoot. I shot one ball towards the middle of the chain. This spurred a chain of events annihilating all of the balls. End of story. I know many, many people who have not even finished the game earned this long before me. Maybe they’re more dedicated, lucky, or know something I do not. I completed level 1-1 in 6 seconds about a hundred times before this, so my guess is luck. This listing of terminology is in addition to the achievements post and the points post, so if you don’t see what you’re looking for here, check those out. If, after exhausting all of these posts, you don’t find what you’re looking for, leave a comment and I’ll add your term to the list. I started doing this to document the difference between chain, chain bonus, chain reaction, and combo, so hopefully this will clear up any confusion for people. Accuracy ball: A ball of any color that has a target on it. When you eliminate an accuracy ball, you are able to shoot the balls quicker for a limited amount of time. Adventure mode: The basic Zuma mode where you play through multiple levels and temples to finish the game. The goal is to finish the game with as many points as possible. Backwards ball: A ball of any color that has an arrow on it. When you eliminate a backwards ball, the front of the chain moves backwards, pushing back all attached balls. Board: The unique background of each level. Each board repeats every third stage. Also known as a realm or platform (incorrectly). Chain: A group of balls. Chain bonus: A bonus awarded for eliminating five (5) or more sets in a row. Chain reaction: Making one move which causes another. See Combo. Coins: Gold pieces which you can shoot at to earn 500-800 extra points. 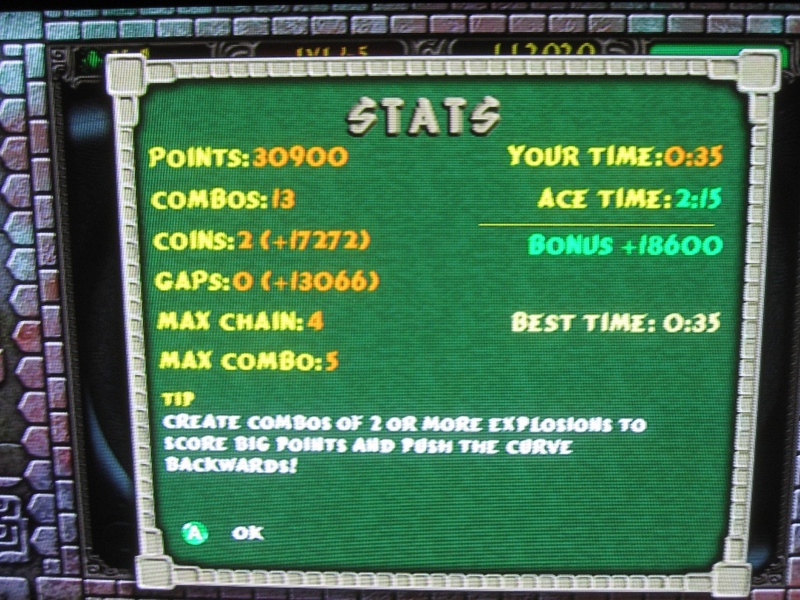 Coins are also earned at the end of a level for the amount of track between the last balls eliminated and the golden skull. This can be worth thousands of points. Combo: Firing a ball at one set of balls to eliminate them when there are balls of another color on the outside of that set, which come together and eliminate after the first set has been eliminated. Explosion ball: A ball of any color that looks like a jewel and flashes. When you eliminate an explosion ball, it explodes, eliminating many surrounding balls. Frog: You. The dude who spits balls. Gap: A break in the line of balls that you can shoot balls through at the row behind to earn a bonus. Gauge: The orange bar in the upper-right corner of the screen which fills up with green as you earn points until you reach the minimum points for the level and new balls stop coming out. Gauntlet mode: The mode of Zuma where you play one board only until you die. The longer you play, the faster the balls come out. Golden Skull: The skull in the middle of the board that the balls move towards. Also known as Sun God. Leaderboard: The ranking of all Zuma Deluxe players of the Xbox. Mode: One of two ways to play Zuma. See Adventure mode and Gauntlet mode. There are separate leaderboards for each mode. Platform: Generally used to describe the framework your application runs on (Xbox or Mac OS, for example), but has (incorrectly in my opinion) been used to mean the board (see entry for board, above). Slowdown ball: A ball of any color that has an 8 shape (possibly meant to be an “S”?) on it. When you eliminate a slowdown ball, the speed at which balls come out slows for a limited amount of time. Stage: A group of five to seven levels. There are 13 stages. Stone Frog Idol: See Frog. Sun God: See Golden Skull. Temple: A group of three stages. There are four temples in Adventure mode. Track: The path that the balls travel on. Zuma Deluxe: The official name for the enhanced version of Zuma available on Xbox and some other platforms. With no Xbox to play and being snowed in, I’ve had time to watch video of Zuma to ponder scoring. I would like to go over this list with the game in front of me, but this will have to do for now. Basic balls get you 10 points each. This means a minimum of 30 points per set. Coins might vary by level. In level 1 I got 500 for a coin, in 12-7 800 for each of 2 coins. Gaps appear to be consistent only within levels. There is some pattern I’m not seeing. For what I consider a “large” gap, you receive 40-80. For a medium, around 170. For a small, 190-650. That’s a very wide range for small gaps. These numbers include the base points per ball. Combos are very consistent throughout the game. You get 100 extra points for x2, 200 for x3, 300 for x4, etc. Chain bonuses increase slowly with each set you break in a row, starting with the fifth. So, for x5, it’s 100 then the bonus increases by about 10 points with each following set. I’m not sure if this is showing the combined total (seems a bit low) or if this is just showing one of the two bonuses. Please comment on what you’ve noticed about the scoring. Of course, the easy thing would be for someone from PopCap to just tell us! So, please, if you designed the game or looked at the code, feel free to take all the comment space you need. In case you were wondering why I’m actually blogging today, it’s because my Xbox broke. We have to send it back for repairs. So, you should see a lot more blogging from me over the next week. If you have an extra Xbox 360 hanging around, feel free to send it my way before I start going into withdrawls. Because I know you’re all dying to know… here are the names of the boards and the ace times for each level. Please leave me a comment if you find a mistake. My notes: This is especially important in level 1-3, a Riverbed Mosaic board. My notes: This is one good strategy to be aware of, but it does undermine the usage of other strategies, so use with caution. There are many other good strategies that people have written about in the comments, so don’t forget to go through and read them. I don’t see a need to copy them all in this post, just to highlight two of the most useful ones. I would also like to take this opportunity to address a question I get frequently about swapping balls. Yes, I am constantly changing balls. It’s compulsive. I do think it helps in the long run, but sometimes it messes me up. No, I don’t think about it. I’m not sure I’d recommend anyone do it as mindlessly and frequently as I do. I with you all the best of luck. If you’re at the point where you can even fathom getting 3 million points in a game you certainly are already a Zuma master and you have my highest respect. Keep playing and having fun. Some girls go to the spa. I play Zuma.